In Windows 7 you can use the Computer window to check the status of all the storage areas on your computer. You can also use the Computer window as a launching point to access your libraries, homegroups, networks, as well as key locations on your hard drive like your favorites list. Windows can display its Computer window in many ways. To make your Computer window look more like the one in this figure, choose Views and then Tiles. Finally, right-click a blank part of the Computer window, choose Group By, and select Type. Navigation Pane: Placed along the left side of most windows, the Navigation Pane contains shortcuts to your libraries (such as Documents, Pictures, and Music), as well as links to your HomeGroup, Network and other areas of interest. 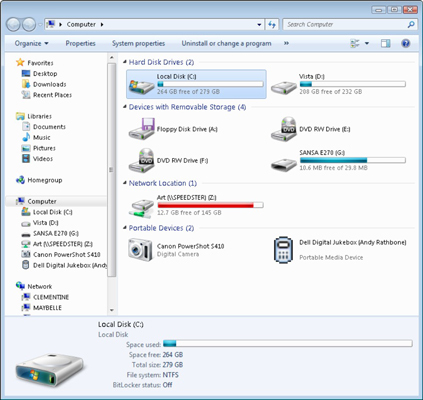 Hard Disk Drives: This area lists your PC’s hard drives — your biggest storage areas. You can double-click a hard drive icon displays its files and folders, but it’s more common to use the Start menu to find programs and the libraries to find files. The hard drive bearing the little Windows icon is the one that contains your operating system. The colored line next to the drive’s icon tells you how much space is being used on that drive. When the line turns red, your drive’s almost full. You need to delete things or upgrade to a larger drive. Floppy Drive: The old 3 ½ drives will rarely appear, but there are still some out there on older PCs. CD and DVD drives: Windows 7 identifies these drives as either R or RW to let you know whether the drive can only read discs or write to discs, as well. Memory card reader and flash drives: Displays portable hard drives and flash drives (typically connected via a USB slot) and memory card readers that read the little cards from your camera, MP3 player, or similar gadget. Their icons look like an empty slot. Unlike Vista and XP, Windows 7 doesn’t display icons for memory card readers until you’ve inserted a card into them. To see icons for the empty card readers, click Organize, choose Folder and Search options, click the View tab, and click to remove the check mark next to the Hide Empty Drives in the Computer Folder option. MP3 players: Although Windows 7 displays an icon like this for a few MP3 players, it coughs up a generic hard drive icon for the ultra-popular iPod. Cameras: Digital cameras usually appear as icons in the Computer window. Be sure to turn on the camera and set it to View Photos mode. If you plug a digital camcorder, cell phone, or other gadget into your PC, the Computer window should sprout a new icon representing your gadget. If you don’t see an icon, you need to install a driver for your gadget. Network Location: This icon is only seen by people who’ve linked groups of PCs into a network. Double-click the icon to browse other devices on the network. Click almost any icon in Computer, and the Preview Pane along the screen’s bottom automatically displays information about that object, such as size, space available, etc. To see more information, drag the top edge upward. The more room you give the pane, the more info it dishes out.